The final emergence of permanent teeth in late adolescence marks the end of a long process beginning in the womb with the formation of our primary or “baby” teeth. Permanent teeth form in a similar way as buds high in the jaw, continuing to grow until the primary teeth ahead of them fall away. The crowns of the new adult teeth eventually break through the gum tissue and emerge (erupt) into view. At least, that’s normally what should happen; sometimes, though, a tooth may only erupt partially or not at all, a condition known as impaction. The crown remains partially or fully submerged below the gum line, causing the tooth to press against other teeth, potentially damaging them. It can also make periodontal (gum) tissues adjacent to the area more susceptible to disease. 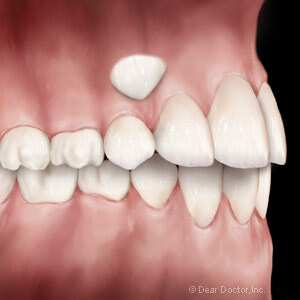 Wisdom teeth are especially prone to this kind of impaction, to the extent they’re often surgically removed (extracted) to avoid future problems to adjacent teeth or the bite. Upper canines (the “eye teeth” normally located directly below the eyes) are also subject to impaction. But because of their highly visible position, extracting them could have an adverse impact on the patient’s smile. In this case, we often attempt instead to expose and ultimately save the tooth. Before taking any action, however, an orthodontic examination is conducted first to pinpoint the exact position of the impacted tooth and determine how that position might affect moving teeth into a more desired alignment. If we find the impacted canine is in a workable position, the next step is to surgically uncover the tooth from the gum tissue (a minor procedure usually performed by an oral surgeon or periodontist). Once exposed, an orthodontic bracket with a small attached gold chain is bonded to the tooth. The gums are then sutured back into place with the chain exposed and allowed to heal. At some future point an orthodontist will attach the chain to orthodontic hardware that will pull the impacted tooth into proper position over several months. As a result, the upper canine becomes “un-impacted”; the dangers to surrounding teeth and tissues are also reduced. And, just as important, we can preserve the tooth and with orthodontics achieve an attractive, normal smile. To request appointment availability, or have any questions, please call our office at (920) 437-1499.